Are you ready to get everything out of this season? Get on the hill and slide down, collecting stars and avoiding various obstacles! 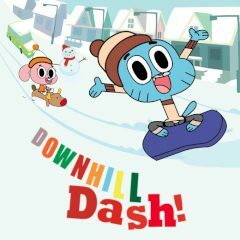 Gumball and his friends are ready to have fun this winter, so they decided to go on the slides. Choose your favorite character and have fun with them right now! Slide down the hill and collect yellow stars along the way, trying to improve your result by making no mistakes.